Y’all, my breakfast room is FINISHED! Oh, sweet mercy, it is finished. And I have a ton of pictures to show you not only of the finished room, but also of how this room started out, as well as a few reminders of the long journey I took to get here. I am thrilled with how this room turned out. Just the fact that it’s finished is exciting to me, but I love spending time in this room and being surrounded by so much color. I also really like that the room is colorful and yet not chaotic, at least to me. It still feels calm, warm, and inviting to me. 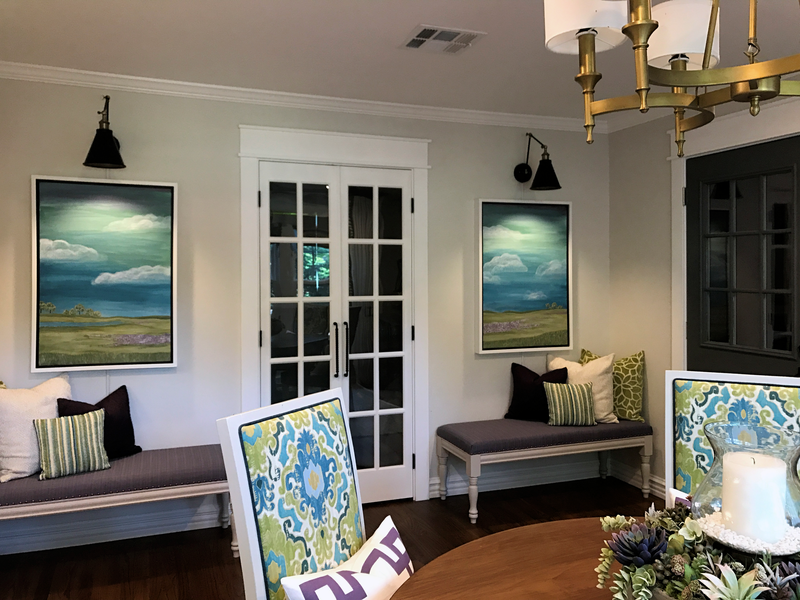 My favorite things in the room are the sconces and paintings. 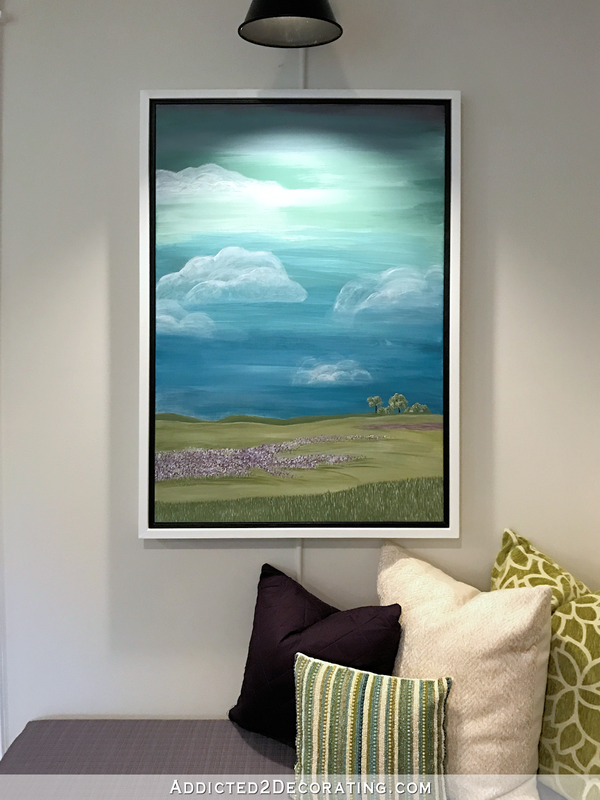 Not that I think I’m some great artist, but those paintings added just the right amount of color to the pantry door wall, and the sconces add such beautiful light. In fact, I added LED lights to the sconces, and I keep them on 24 hours a day. During the day, I love how the light washing down over the paintings makes the colors even brighter. And in the evenings, the 40-watt-equivalent warm LED lights are the perfect amount of soft light in the room. I really like not having to walk into a completely dark room during the night. Do keep in mind that my kitchen isn’t completely finished yet. 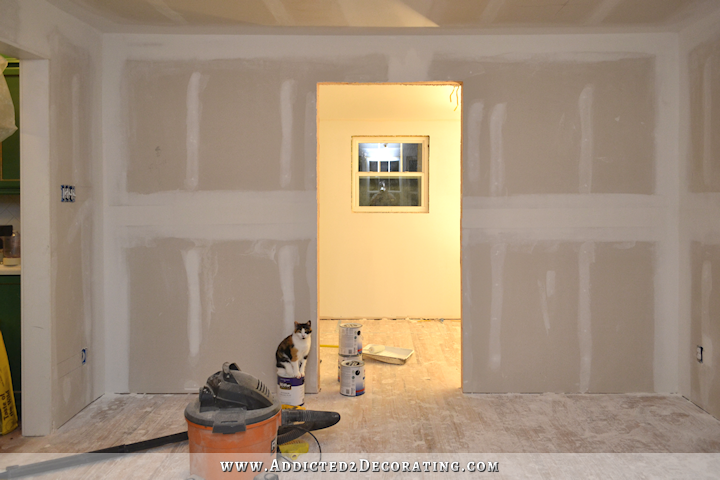 I still have some trim to paint, trim to install, cabinet doors to install, and some decorating and accessorizing to do. It’s looking a bit bare right now, but I hope to get it finished in the next few days. 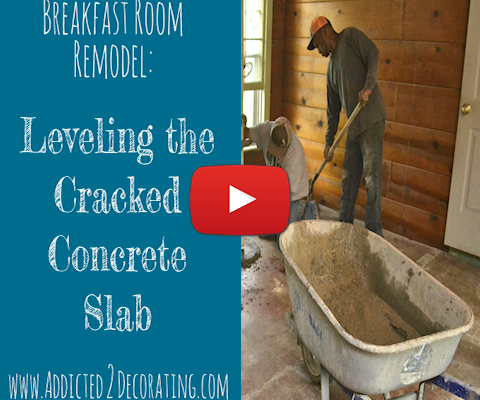 But today is about the breakfast room, and now that you’ve seen how it looks now, let me remind you where it started. On the day we bought the house, this is what this room looked like standing at the back and looking towards the front of the room. For reference, the door leading to the garage is in the same exact spot now that it was then. Do you remember that dark, cave-like room? I certainly do. And it scared the heck out of me, but I was determined to tackle it. It had old green carpet, old wood windows that were incredibly hard to open, and a dark stained plywood ceiling that was attached to 2 x 4s that had been dropped down about 7 inches below the actual ceiling joists. There was also a wall between this room and the kitchen. That wall sat right where the kitchen peninsula sits today. 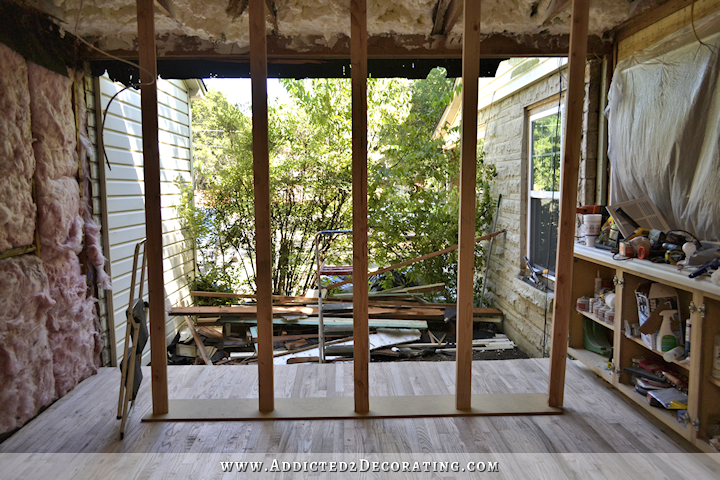 And then I got to work ripping down all of the plywood and shiplap. 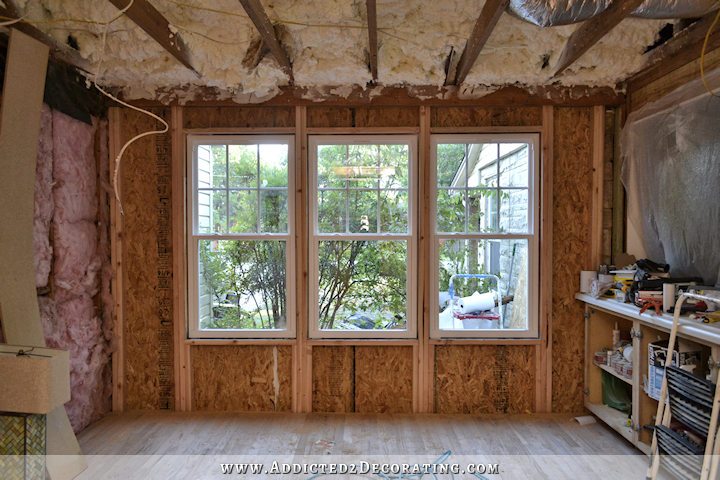 Somewhere along the way, we had our attic insulated with spray foam insulation, which I love! 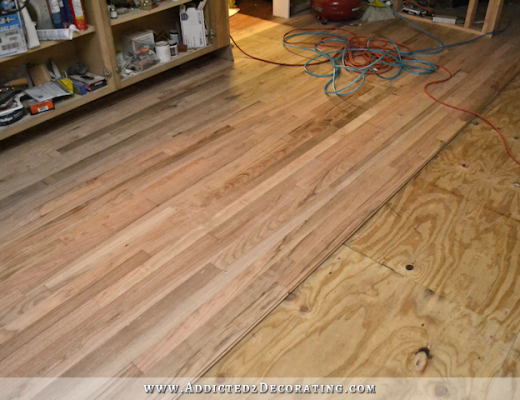 And then my brother and I put down a new subfloor so that I could use the same nail-down red oak hardwood floor in here that is in the rest of the house. He and I also completely rebuilt the front wall of the room. 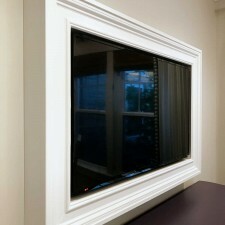 We reframed it, adding a lot more support than what was originally there, and installed new windows. 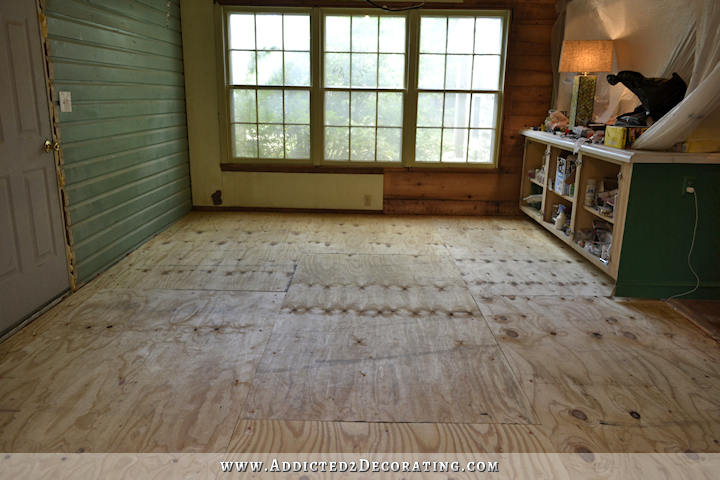 …stained and polyurethaned the floor, and got the room ready to decorate. That’s where the room had that awkward curved ceiling towards the back of the room. 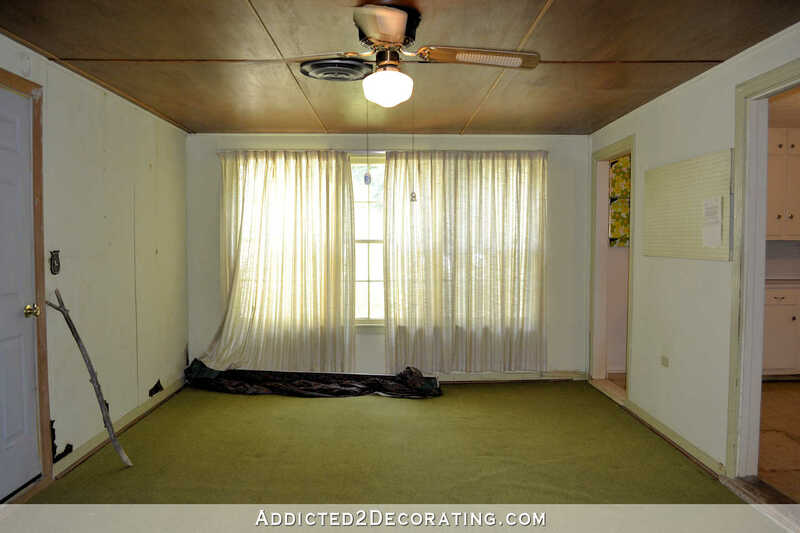 It also had the same green carpet, the same 1/4″ plywood over various types of shiplap, the same dropped ceiling, and the same cave-like feel to it. Phew! It’s been a long road to get here! So now that you hopefully have your bearings in this room, here are a few more “after” photos without the commentary. Previous Post DIY Range Hood Cover - Finished! 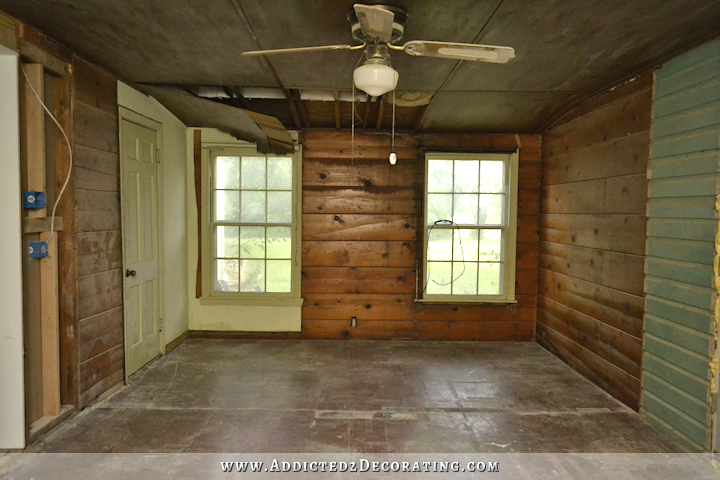 Even though I’ve followed along since before you bought this house, and I remember what you started from, seeing the before and after pictures is still baffling! 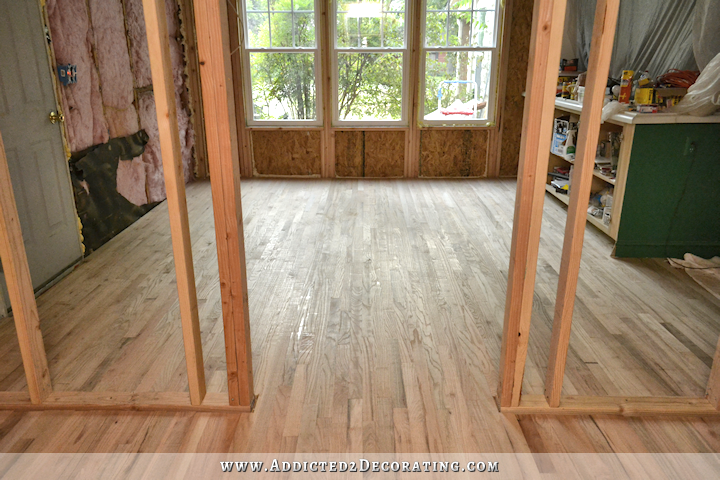 You have truly transformed this part of your home into something stunning! Wow Mark, you make such a great point! It is awesome watching the real process – and not a half hour or one hour tv show… this is the real deal 😀 And it is BEAUTIFUL!!! AND she did it almost ALL by herself!!!! My idol!! 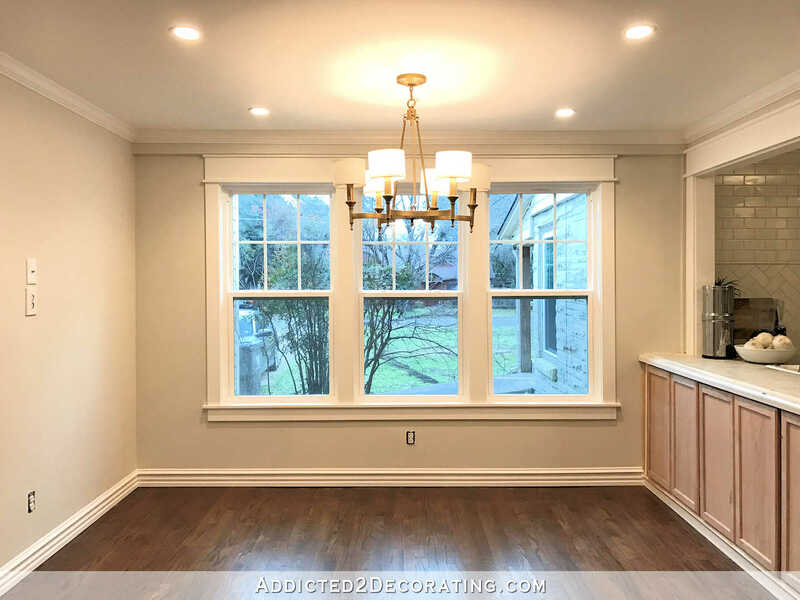 Yes Mark… I have too been following this renovation for quite some time now and this has been an amazing process and certainly shows that nothing happens overnight. It is a beautiful result and all power to you Kristi for sticking with it. I am sure that there have been many times when you have wanted to just give up. It is a long hard road when you are doing this on your own but you have shown that it can be done. GREAT JOB… AND IT IS STUNNING!! Magnificent. Just nothing else to say but MAGNIFICENT!!! Congratulations. It’s beautiful! What a wonderfully good job you’ve done! Serene, happy, colorful… Truly beautiful room. Thank you for letting us share in your journey. Unbelievably beautiful! You have taken an ugly duckling to a beautiful swan. SIGH….I love it Kristi, beautiful job. The colours speak to me, you have done a masterful job! To borrow an old ad phrase, “You’ve come a long way baby!” It’s truly beautiful and you should be so proud of yourself. You are so inspiring. Breathtaking! And so inspiring. Thanks for sharing all of this with us. Your blog is fantastic. Seeing you work through projects, planning, rethinking, and sometimes redoing things is really liberating. I often find myself stalled because I’m not sure which choice to make or with direction to go with a project. But now I’m less afraid to just try something, with the knowledge that if it doesn’t work out, I can change it! Well said, Susie. I agree completely and couldn’t have said it better. I rework things often and it’s comforting to know that Kristi, with her unending skills and talents reworks and changes things too sometimes. Such an amazing transformation! 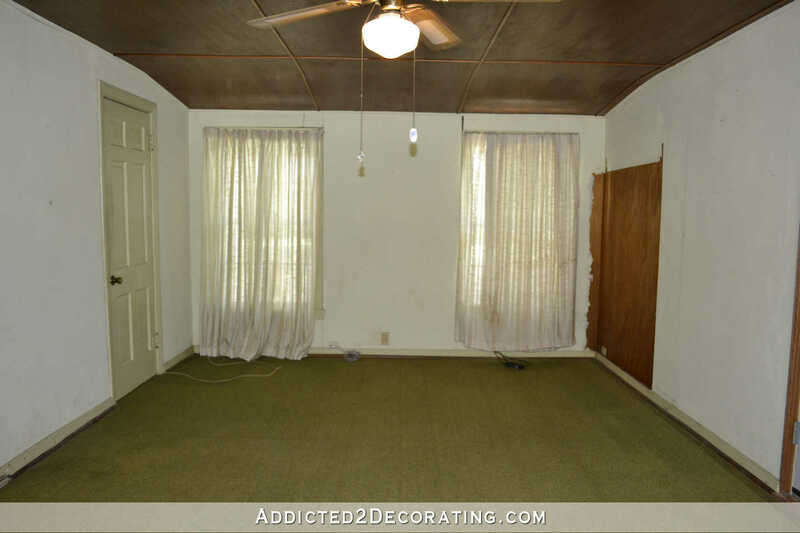 I can’t imagine having the vision to take that room from the before to the after. Bravo!! Ditto! Well said. I agree completely! Your breakfast room is gorgeous! If it were mine, I would do away with the Greek pillows on the chairs and the plates above the tv. I like simplicity. Less is more kind of thing. 😊 But it is your room and it is beautiful, regardless of my opinions! Nice work!!! That was my exact same feelng, too many pillows and the plates aren’t necessary. But as you say beautiful and gorgeous. I just love this room so much! I wish you could do a room in my house with such colors! Congratulations ! I especially love how you tied in the colors with the fabric, the paintings and the plates. Perfect . Gorgeous! Absolutely gorgeous! 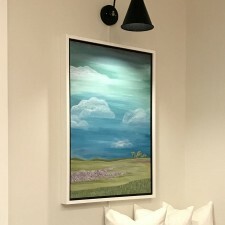 Your paintings are incredible! 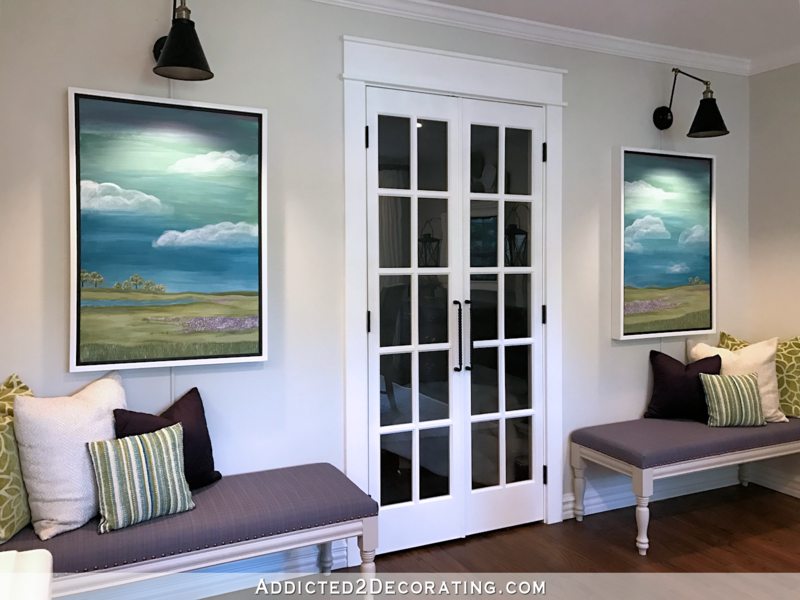 Kristi Linauer that room is a Masterpiece! Absolute Masterpiece, work of Art! I love all your pops of plum spread over the room. I Love everything about your centerpiece. 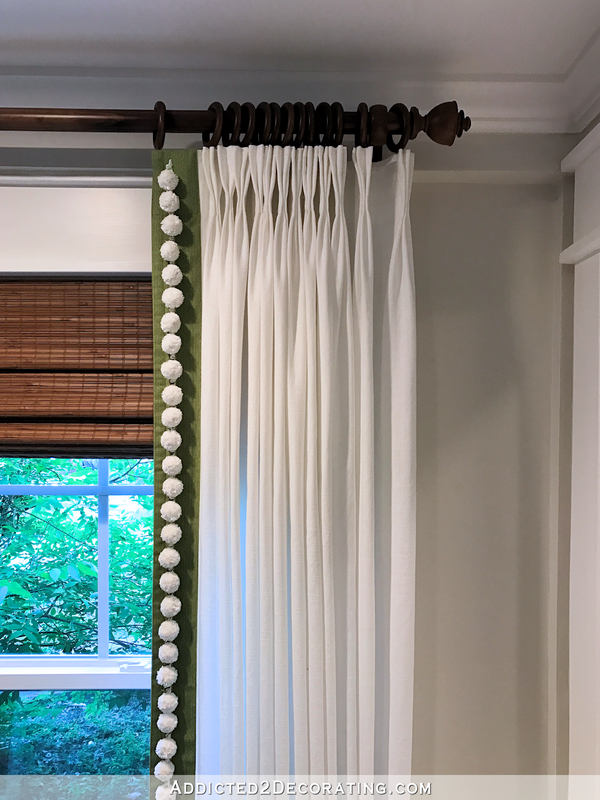 One of my favorite parts of the room is the TV wall with the lanterns, but I love your curtains – Everything! A True Kristi Rembrandt! Have a blessed weekend!! I am quite emotional, seeing it after all that hard work. It is beautiful. I so agree Colleen…you get wispy eyed when you see the total project from beginning to end…incredible change …such a transformation. Kudos to Kristi! Now take a moment to savor it each time. You sit down to enjoy a meal with your precious loved ones. So glad that you finally got back to the roots of what you love! It turned out beautifully! 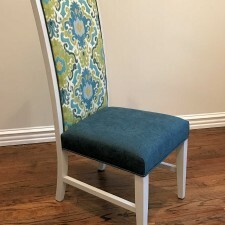 I love that you sourced most of your goods at stores that most of us have access to, showing us that all you need is some creativity to have a unique, personalized space. 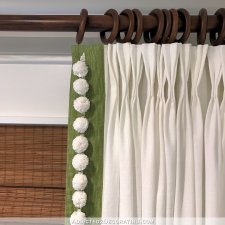 So many designs use out of reach items and this can be discouraging for the average DIY-er. Your room is gorgeous!! It’s absolutely gorgeous…but I’m sure you aren’t really ‘done’. In a couple of weeks, you will decide something has to be changed…..lol….I hope I’m wrong. WOW!!!! I am in love!!! When are you inviting us all for breakfast??? You truely are an amazing woman!!! You have done a PHENOMENAL job, Kristi!!! It’s beautiful! Absolutely stunning..you are amazing! I enjoy your blog so much and have been in awe of the process, your hard work, and your creativity. Thank you for sharing your journey. Congratulations! Unbelievable. What a wonderful transformation. You are such an inspiration…. thank you for sharing your journey with us. I am looking forward to the next room! What a lovely room! Congratulations, Kristi, and thank you for sharing the journey. Can't wait to see the finished kitchen! Goodness! There's so much to look forward, too! 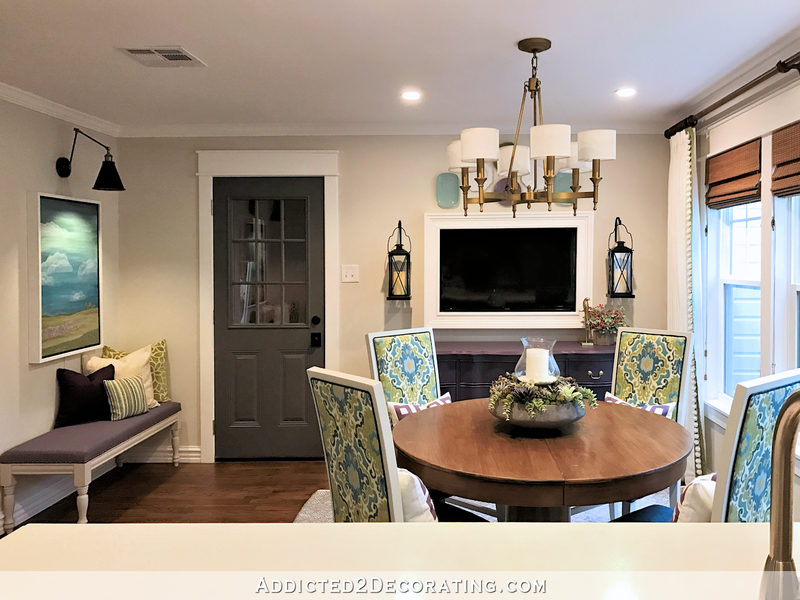 I love what you have done with this room! It is beautiful, and practical, and the use of colour, lighting, artwork and accessories is absolutely brilliant. It’s inspiring to me. Thanks for sharing. Truly stunning work. She never ceases to amaze me. Congrats to you and Matt! I’m sure it looks and feels fantastic and so satisfying. I am so inspired! I am so Impressed. Also you are such an amazing designer. You have created a wonderful oasis and, I cannot wait to see the rest of your home as you continue. 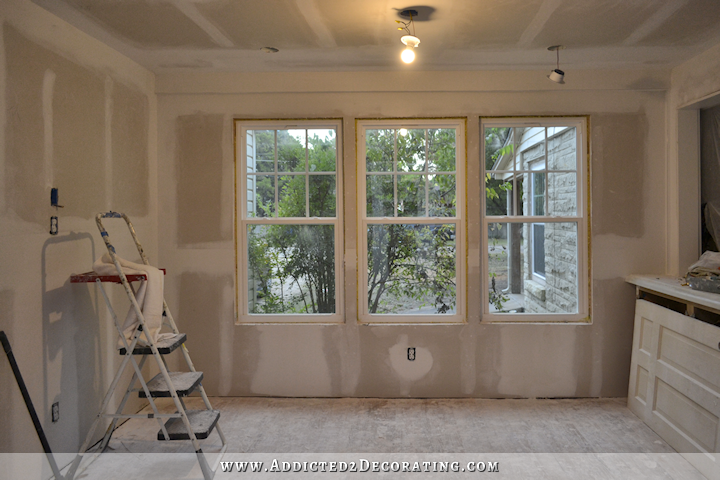 One of my favorite this about witnessing your home transformation is patience. I think it a good lesson for anyone redecorating or renovating, themselves, or hiring a professional. And I don’t mean the actual time it takes, I mean the patience to let the process continue even when you may not be sure of a single element, because it is all part of a whole. 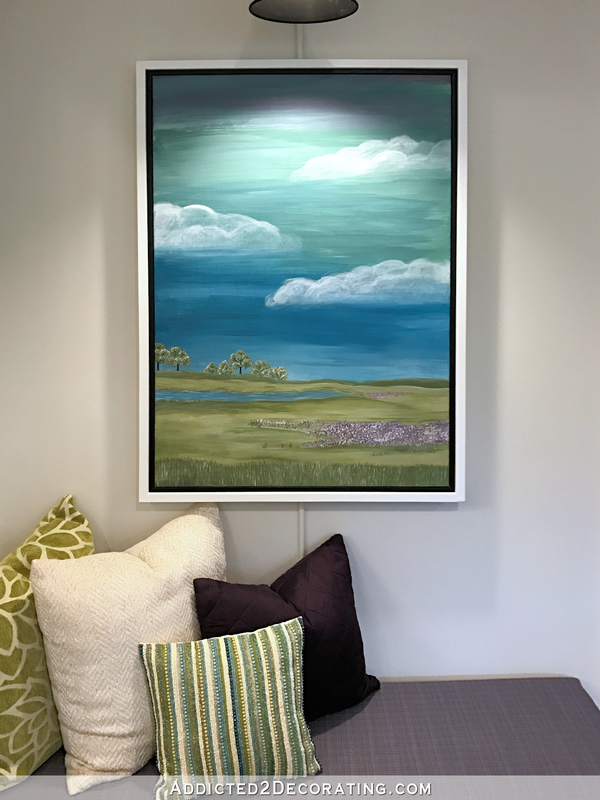 Yes, change things that are not working, but also see everything as part of a whole, once everything is in place all the elements create a complete, idea, and you have an incredible, beautiful, and livable space. I am so happy to see your true style. It is a whole house design, not just random pretty things thrown together. 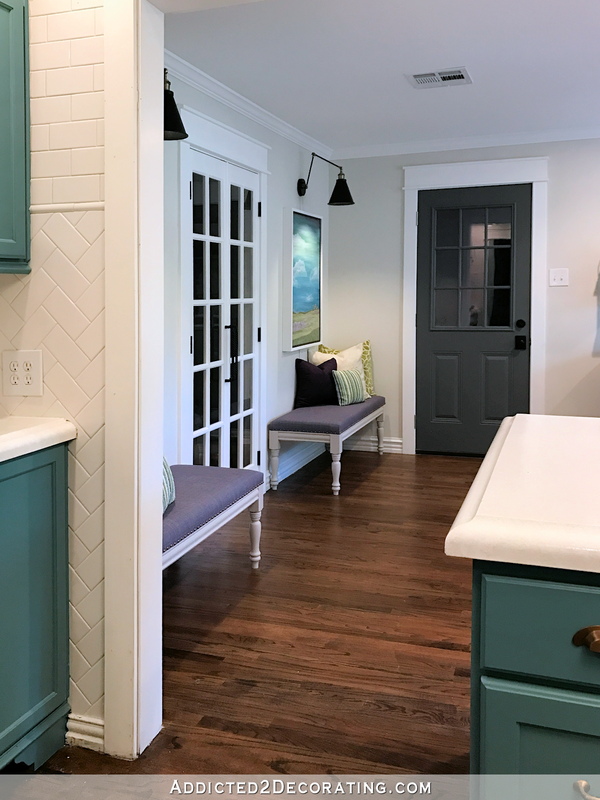 I love the teal color on the cabinets now. What was that color again? I’ll share that info next week on the kitchen before and after post. 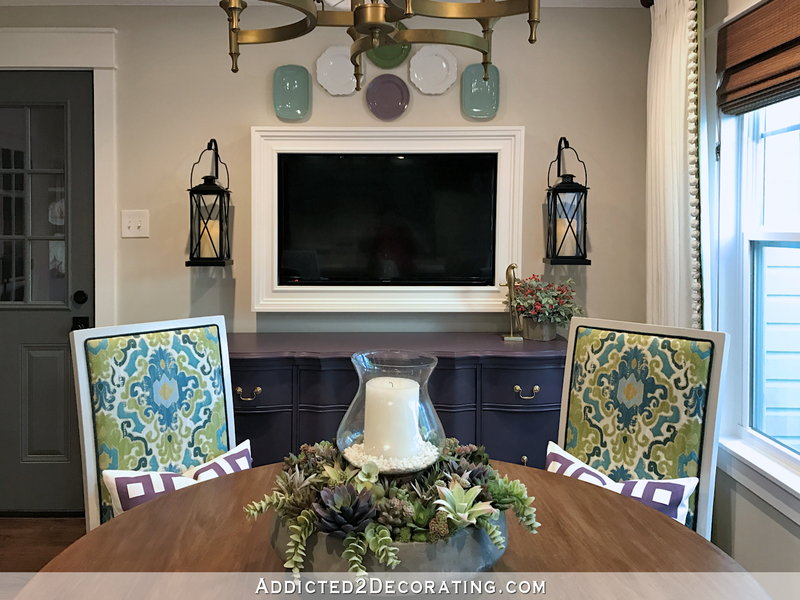 It was a custom color that I mixed myself, and Benjamin Moore had such a hard time matching it, and made several failed attempts. I want to be sure that the label on the can actually matches what’s inside the can before I give out that formula. So let me double check that with the Benjamin Moore folks, and I’ll have the info for y’all next week. Congratulations! I am having so much fun watching your progress! Great job! Perseverance pays off! Oh, you are amazing beyond words. Now that is all. Wow, wow, wow!!!!!! I’m blown away to see the final reveal. What a transformation this room has been through. It looks absolutely stunning Kristi and can imagine how ‘giddy’ you are with excitement to have this finished. It is a real credit to you in your vision, your design, your skills and your ‘guts’ to do it. It is such a beautiful serene room to start your day having breakfast in here. 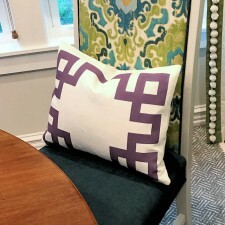 The colors go to together so well and seeing your new cushion fabrics for the first time…..they are gorgeous! As one of the other commentators said, and I agree wholeheartedly, you have taken an ugly duckling and turned it into a beautiful swan! You and Matt must be so proud of your achievement. Well done!!! Kristi, It is incredibly beautiful!!! You have outdone yourself! Wow! Just Wow! Truly inspirational and Yes you are an Artist! Beautiful! Thank you so much for the time you put into writing these posts. So very helpful. Amazing transformation! Congratulations on a job that is way beyond well done. Go along on your reno journey! You’re such a genius, everything you do, the colors you choose are always perfect. I really love this room. Best wishes for many happy memories in such a beautiful room! You’ve done a beautiful job creating such a Happy Space! Enjoy ;-D! I have a confession to make. I have been a wreck during this makeover process! I decided I would not read for a while and let things happen. I check every day to see where you are. Today was the day! YAHOO! Without sounding a bit dramatic, I don’t know how to tell you how proud I am of you and your work. Your talent and ability is breathtaking as is the finished product! To think what you achieved is beyond belief to me. Thanks for the ride. I look forward to more from the ongoing saga home renovation saga! Once again, great job. This is going to sound inappropriate and strange but I feel so proud of you! I feel like I’ve gone through this process alongside you and you’ve finally come through the other side 🙂 enjoy this special new space you’ve created! THIS IS STUNNING!! 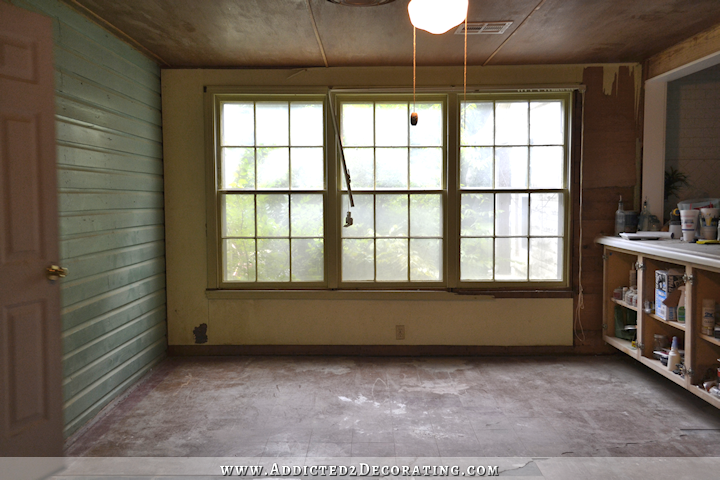 I have followed this progress from the beginning, and I cannot even believe its the same room! I absolutely love the color combos, and actually just love everything about it. You have done an amazing job!! LOVE the pics on the side of the pantry doors!! I love it! Colours chosen are spectacular. I am sure you will enjoy this room too! You are an amazing decorator! Stunning! I can see why you plan to spend a lot of time in there. I would too! Every little detail pulled together so beautifully. I’m amazed. I love that you show how to create such beauty on such a reasonable budget. What you do suddenly becomes a possibility for the ordinary person. 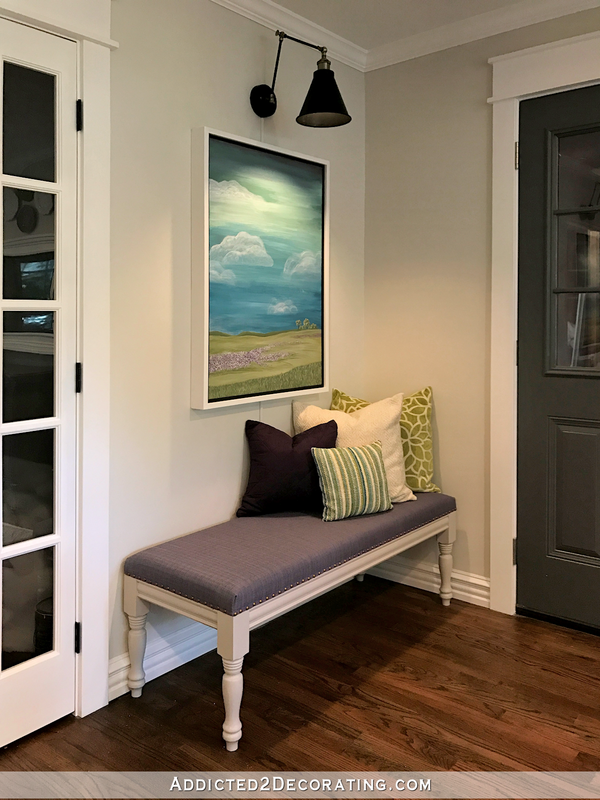 I love watching decorating shows but their budgets are often not feasible for the everyday person and you show us how to create a custom, designer ‘look’ on a reasonable budget. My only question is how does the average person like myself learn some woodworking skills. How did you start? To tell you the truth, I am scared of my husband’s circular saw and a lot of his tools. I would love to tackle some of the projects you show but the use of the tools is the ‘stop’ for me. Any advice on how to gain better woodworking skills would be appreciated Kristi. WOW! I absolutely LOVE IT! It’s been a long road but it’s done, looks amazing and you should be proud of your work. Gorgeous, calming, interesting, peaceful, and energizing all at the same time, and wonderfully unique. You are impressive. 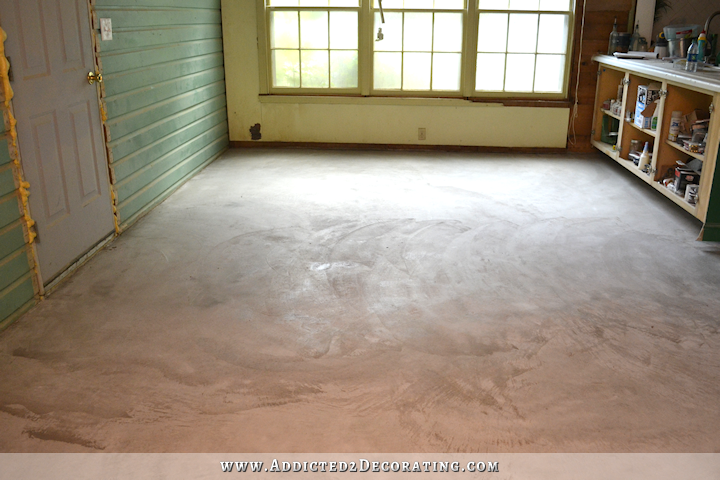 It’s been a while since we’ve seen a fully completed room from you and I have to say…It’s LOVELY! Has to feel fantastic. Fabulous! And I loved the journey! I know re-doing things may have been frustrating at times, but I am so glad to have learned what I did along the way. If you hadn’t changed course there is so much we never would have seen how to do. 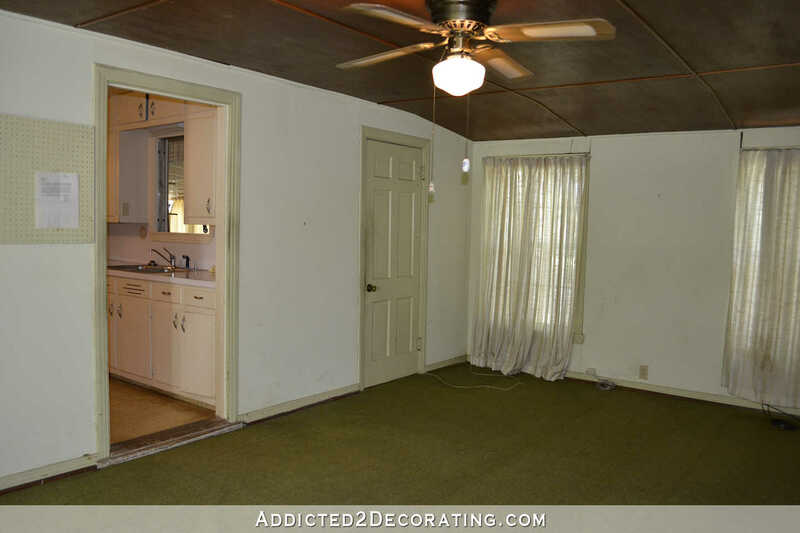 I loved the mural wall, the yellow piano, the green kitchen and all the trim that eventually went away. Not that I disagree with your changes at all…just so happy to have learned so much! You make me braver. 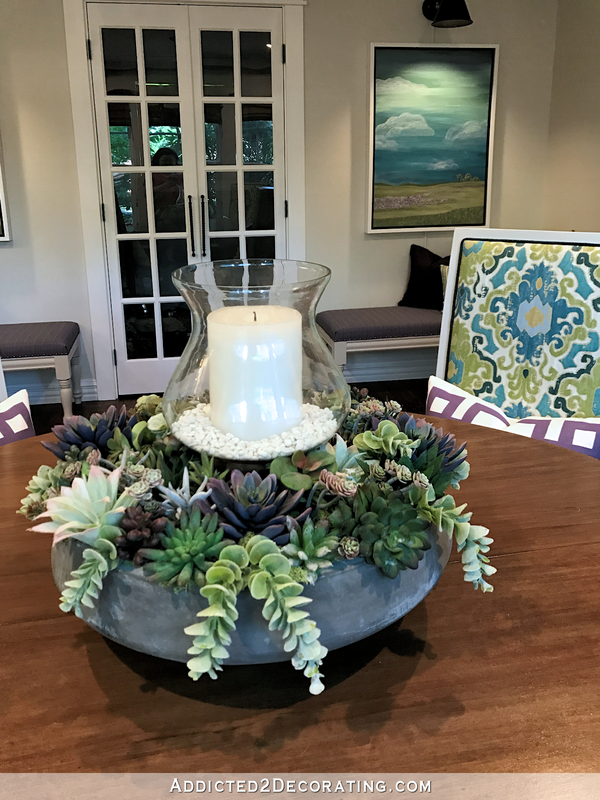 And my favorite part of the whole room is how the plum color in the succulents and the paintings make it all go together so “effortlessly”. Of course I’ve seen the original, but my goodness, what a transformation! I’m so happy for you, it’s absolutely beautiful. So, so happy for you and Matt! I hope he loves it too. It’s elegant, yet not imposing or stiff. It’s comfortable and livable but definitely a room for adults to appreciate. 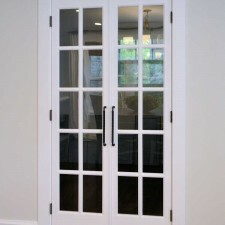 Despite the missteps, or perhaps because of them, you have a fabulous living space, and I am thrilled for you. This is why you don’t settle for your first ideas. Beautiful!! This room just screams “Kristi!”. It is so you and such a relaxing room. You are so inspiring, and I love how open you are. I love that you let us see your indecisiveness and share every phase of the process, even your frustration and when something doesn’t work. I have a whole house to conquer. 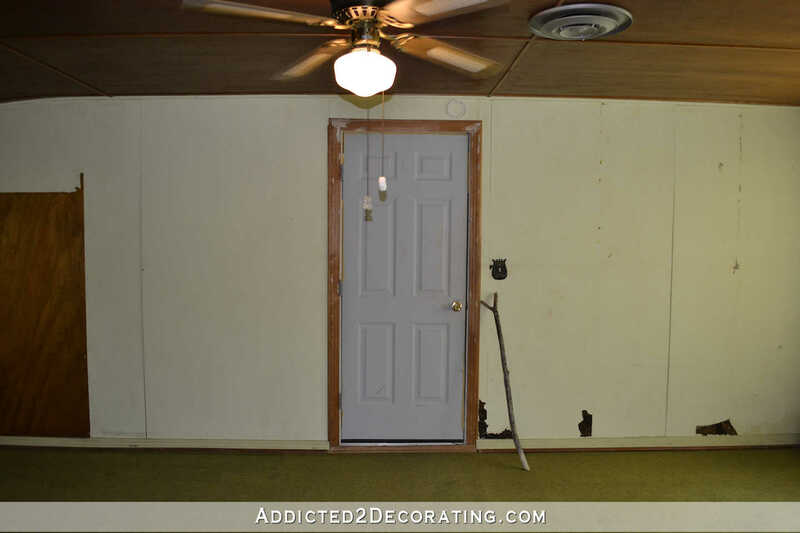 No major remodels, it just needs some serious decorating. We bought it last fall and it’s a complete blank slate. 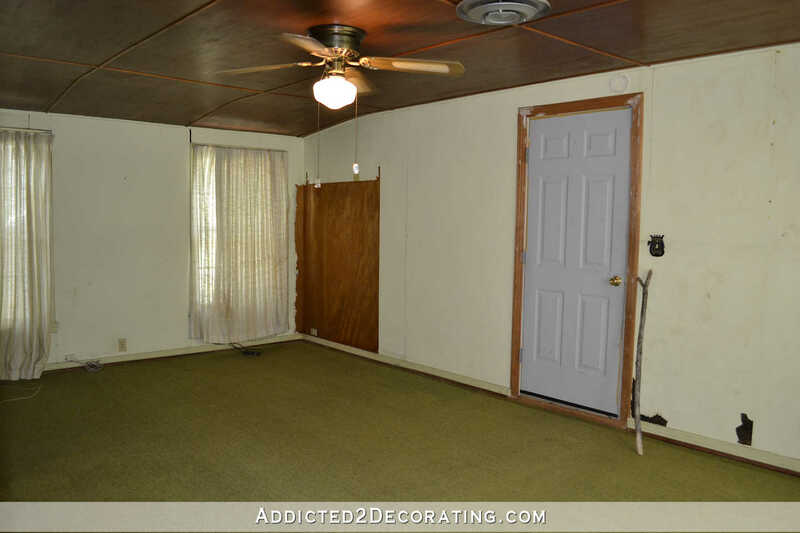 The sellers painted every single room the same color before selling and it is killing me. I have no idea where to start, but I’m going to take a cue from you – pick a room, finish it completely, then go to the next room. I do have one question for you. How is your floor holding up to Matt’s wheelchair? The carpet and flooring was all brand new when we moved in (and not what I would have picked though it is really nice) and I feel like it is showing wear and tear from my husband’s wheelchair already. I’m going to have to redo it eventually and I need ideas for something that will hold up to a wheelchair long term. Bravo!!!! Can’t tell you how impressive that makeover is! You are inspirational! Love it!! Just spectacular! I am so impressed how you could look at the old rooms and have that vision! Well done. Time to enjoy it! BTW- Thank you for the inspiration I needed for my living room. 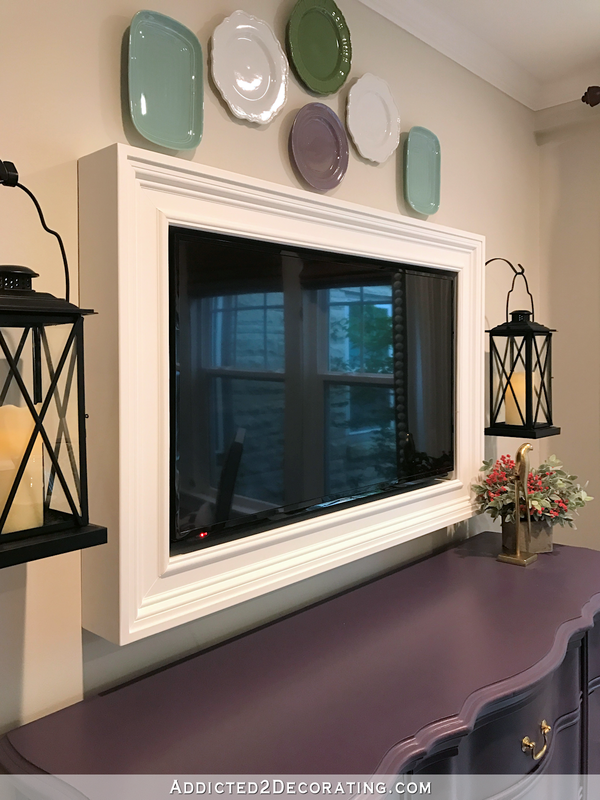 I found two wooden lanterns at Home Goods and inspired by yours, found some rod iron hooks and mounted them on either side of the mirror above my fireplace mantel. 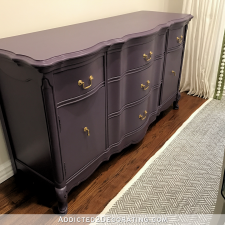 Looks fabulous!Great job on the blog. Always am excited to get the new updates in my email. Breakfast, lunch, supper and snacks!!! Wow what a difference, hope you take time this weekend to enjoy! You did it! You did it! You did it!! Wow!!!!!!!!! 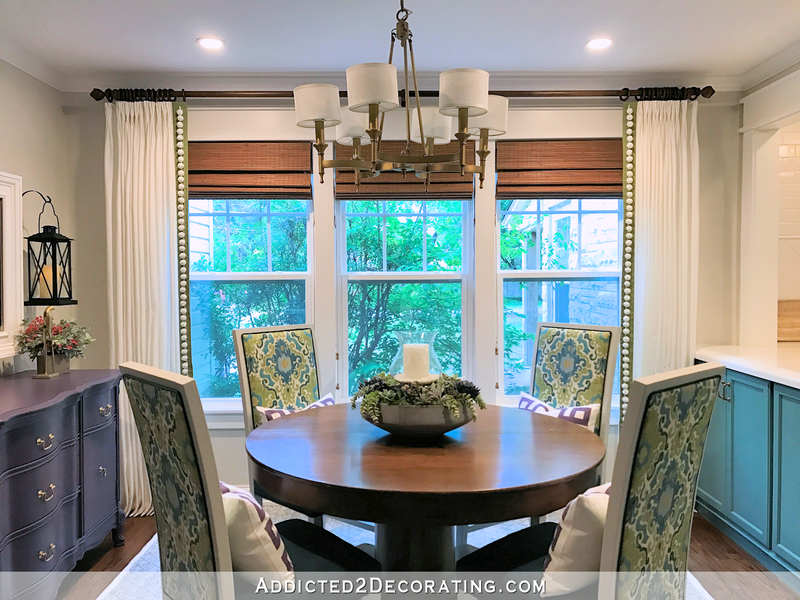 I have followed you for a very long time and I am so happy that you were able to finish your much needed eating space and that it screams Kristi! Can’t wait to see the finished kitchen! My favorite thing in this room is EVERYTHING! It is just beautiful! OH. MY. GOODNESS!!! I am raising my imaginary cup of Sonic Iced Tea with the world’s best ice to salute you!! Fabulous and unique and all you! Congratulations! This looks absolutely beautiful!! I expect to see this beautiful transformation in the next issue of House Beautiful!! I’ve been watching this transformation as you post them, but seeing it all together and then post the before pictures in the same article makes it more astonishing. My favorite picture is the one from the kitchen looking into breakfast room. 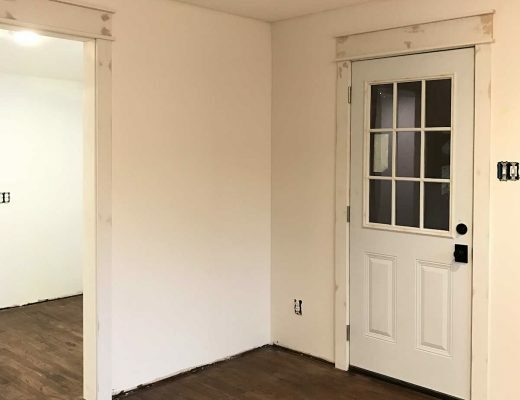 It has to be nice and look at a completely finished room! Congrats again! wonderful job!! Terrific job, Kristi! I really love the colors you ended up using! You should be feeling very proud of yourself for a job well done! Congrats! Absolutely awe inspiringly – all that hard work! What a stunning transformation!! Great job! Can’t wait to see more rooms!! Congrats! Well done! And so you! This is beautiful, and it was quit a journey, for you and us! and in colors I love, too! You have shown us the inside/downside/up side of the whole process, and for that, I thank you! It really helps to know that you can do it, just hang in there and be persistant. Doing it right reaps great rewards! You are an inspiration to many, and you have provided a wealth of info to us who need to redo on a very limited income, and have made it much easier with your excellent tutorials. So beautiful! Your jewel tones and accessorizing are en pointe! I bet you will spend all your time in there just absorbing the loveliness. Lovely! A room to “LIVE” in ! Not just pretty. I am so happy for you and Matt. I feel you needed a room to be together in. This is it! Your retreat from the remainder of the work left to do. Do you ever get to just soak in your tub in your lovely bath? 2 Almost 3 rooms completed! Loving reading about your journey! Wow! This room is stunning. My favorite is the artwork as well but all the details are perfect. 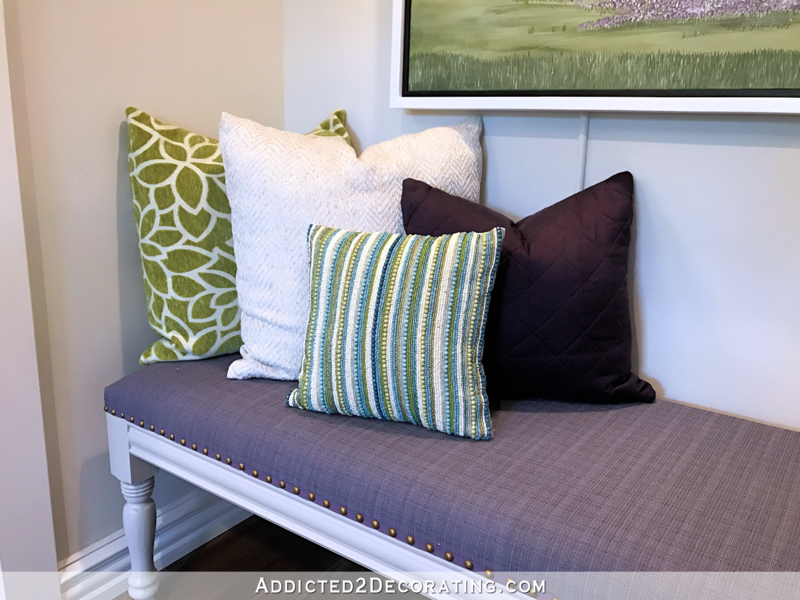 Love all the textures in the pillows and on the curtain trim. So pretty. Good for you. What a transformation! It must be awesome to be working in the kitchen and then just look at the beauty in the breakfast room. I hope Matt is thrilled. Wow, just wow! You blow me away each time. What a gorgeous room! I don’t have any favorite because everything is pretty amazing, however I love how it looks different from so many other blogs. Well done, Kristi. Well done. Everything you have done looks great–I love all of your choices! I love the colours you’ve chosen and the way they work together and get repeated without being boring. 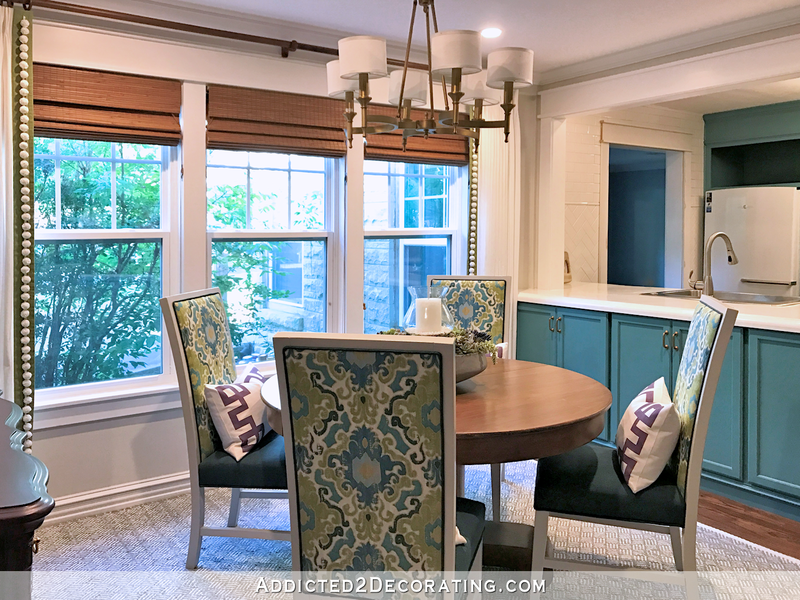 Even though the reveal is of the breakfast room alone, I have to say that I love the combo with your new kitchen colours! 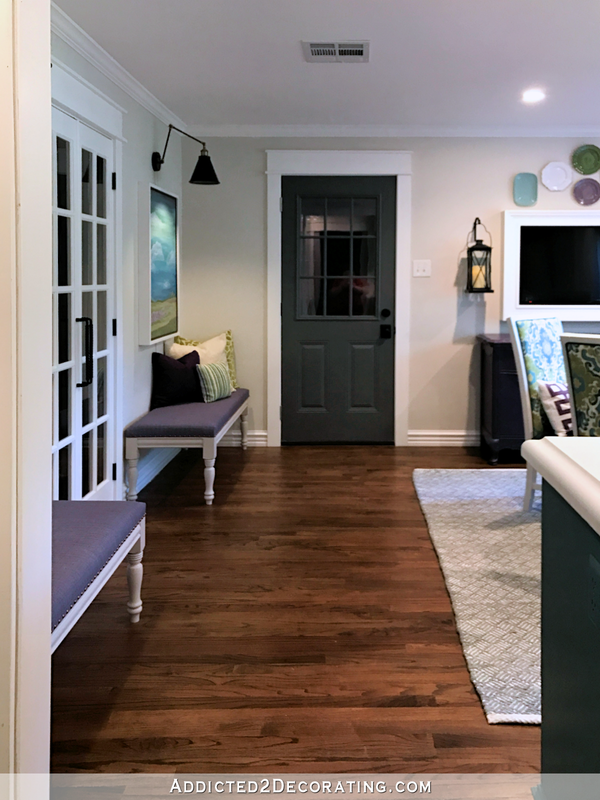 I was really impressed with the green kitchen, but this is more relaxed, more fun and – in my opinion, without knowing you other than from your blog – more you. I wish you both many many wonderful hours in that lovely room, eating, relaxing, enjoying it with friends and family! as always: thanks for sharing the journey! To me it’s always fun to see ” before and afters”. This is just amazing! Your talent (and skills) are incredible. Like so many others on here, I want to thank you for taking us on your journey with you. Thank you for giving your sources and showing all of us that a warm, welcoming comfortable home doesn’t have to have designer price tags! Take the weekend off, and you and Matt celebrate! It’s so well deserved! I love every bit of it!! 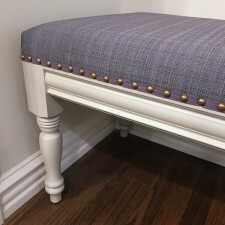 I loved how you brought in the touches of purple in the pillows, benches and the plate to tie in the buffet (Which I ADORE). Congrats!!! This room is stunning! I would have never imagined using the purple! Love it. Gosh I do love those paintings though! The colors look just perfect with the kitchen cabinets. Definitely my favorite part as well! 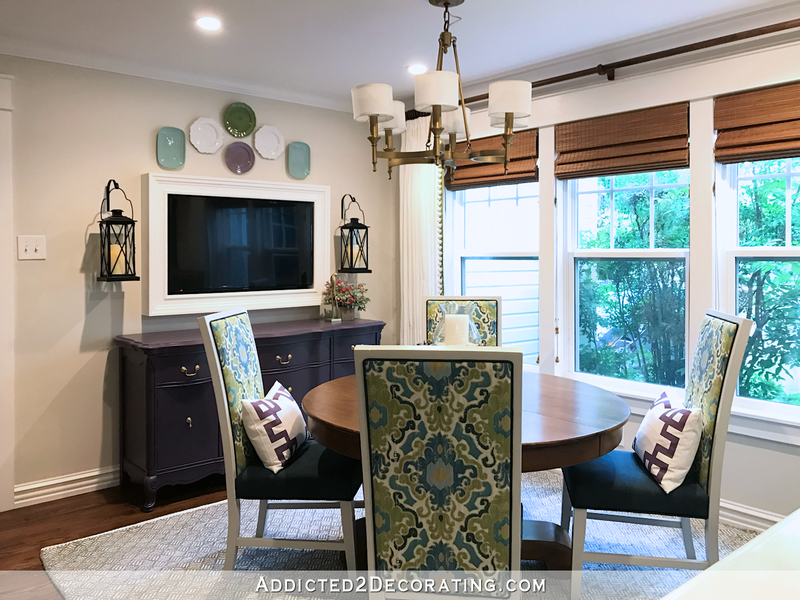 Kristi I know you are a decorator and you obviously know what you are doing but I have to tell you I LOVE that when you look at the windows you see the green on the chairs matches the green with the pom poms. I know that is a little thing but I think that is wonderful. 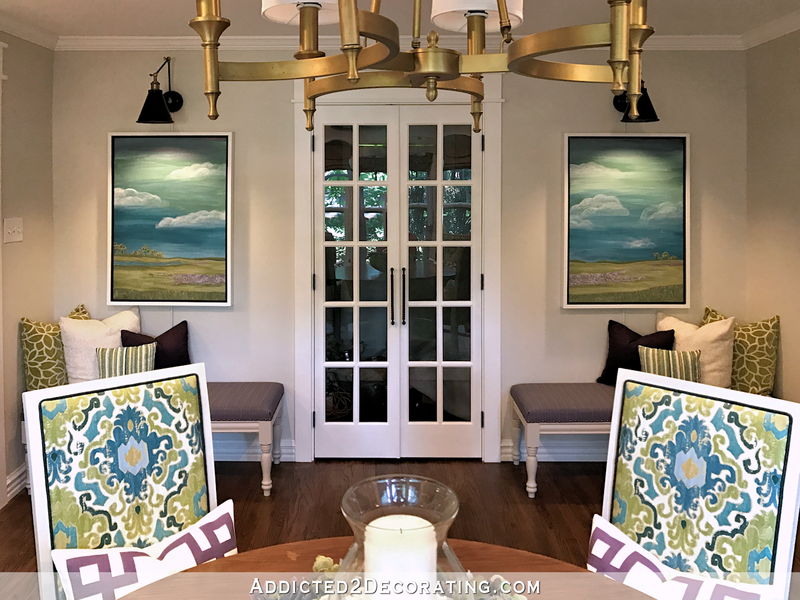 I love the whole room but especially that and the sconces. Kristi you are absolutely amazing and I can’t wait to see the rest of you house. So you! I totally love how it all turned out. I know you aren’t taking a breather, but at least give yourself a huge pat on the back for a job well done! Now – get that garage and sunroom cleared out girl! ;-)) JK, take a day off! Massive achievement – I’d be delighted to sit at your table in such a beautifully transformed room! IT’S. SO. BEAUTIFUL! The transformation is stunning. The “before” was quite bad, and as you peeled away the layers, it got even worse. This was truly a monumental undertaking. That the “after” looks so AMAZING is a testament to what a skilled builder and artist you are. 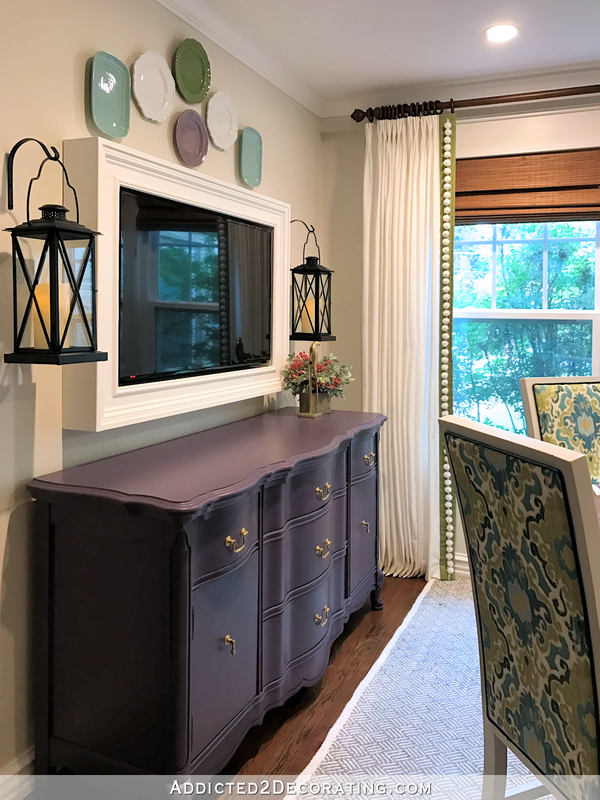 Major kudos, Kristi, you deserve a standing ovation and ceaseless applause for this renovation. Everything about it is just so lovely. Take a bow! 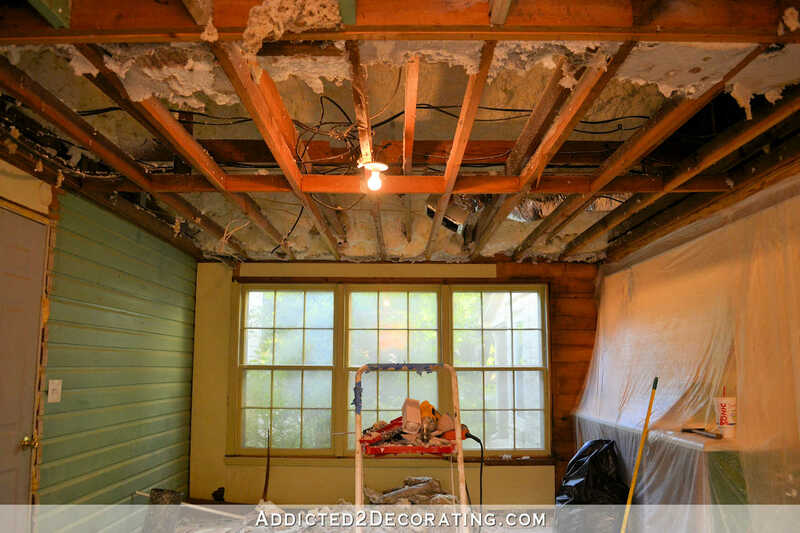 You are a renovation rock star! Absolutely fabulous!!! I LOVE those colours!! Gorgeous, gorgeous, gorgeous…EVERYTHING! Well done! What a lovely room, and what an accomplishment! And it’s not only lovely where you can see, it’s well-constructed where you can’t. I imagine many serene and happy mealtimes spent here. Congratulations on a job WELL DONE! Well done – looks awesome. How satisfying this must be for you!! Let me bring you a casserole…oh heck you deserve a margarita!!!! I am one judgmental, critical, and over analyzing woman and didn’t understand how you were going to bring this all together. But this looks marvelous. I have just moved to the state of Texas and learning the lingo…And you cleaned up in a big way!!! Absolutely stunning! I love the colors you used, and love that you did almost everything yourself. Great job! Wow! High five Kristi, you rocked the breakfast right out! If this was my breakfast room, I would totally leave the lights on 24/7 just so I could admire that awesome space! Thanks for posting all the great before and after pics as well as the detailed list of the materials and supplies used. Hi Kristi, this room is so lovely! You’ve done an amazing job. It makes me really happy to think of you and Matt having this beautiful oasis to relax in and enjoy. A stunning transformation! 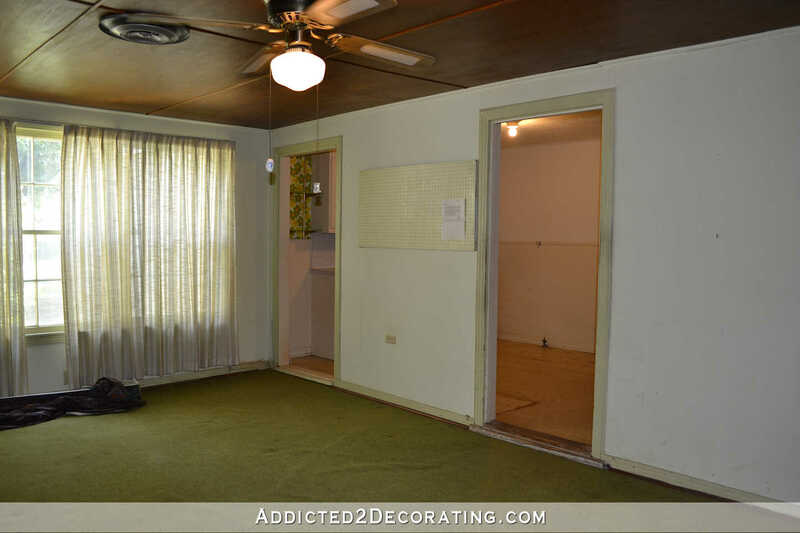 It takes a lot of imagination to see that room with the ugly green carpet and weird ceiling and know what it could become. Brava! Thank you SO much for sharing your journey with us. It is spectacular! 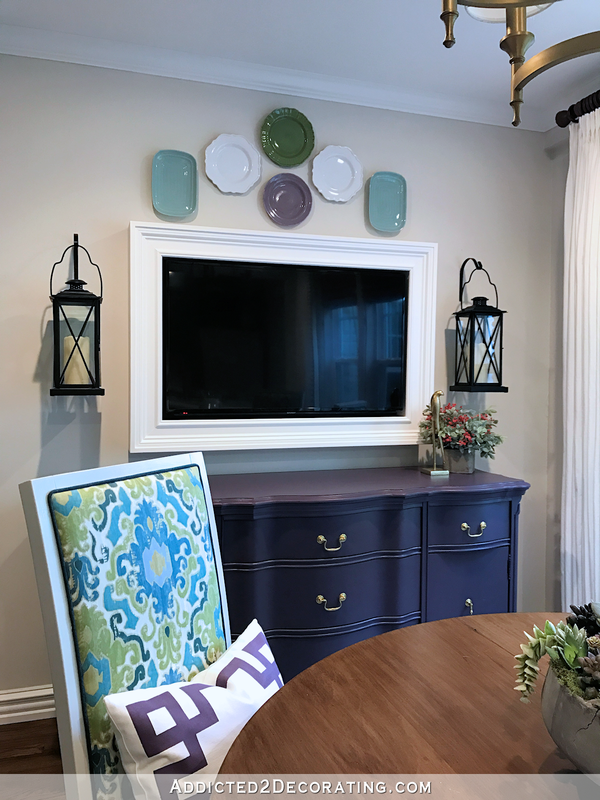 The plates above the TV are one of my favorite parts (although it’s hard to have favorites when it’s all so wonderful!) Thanks again, Kristi! omg Do you read ALL the comments?? I SO enjoyed the journey and will continue to do so. Your ups and downs keep it real. I don’t have the words to express what an inspiration you are to all of man kind!!! Your talent, creativity and honesty about short comings and struggles of DIY’ing. You are simply a breath of fresh air in this often times stressful world!! Thank you from the bottom of my heart for allowing me and everyone else to witness all of this and be a part of your life. AND……I think you are one heck of an artist! I wouldn’t down play your abilities at all!! P.S. Your range hood cover is stellar!! What a wonderful adventure you have taken us all on! I have loved every thing you have done in your house, but I have to say this is my favorite room, for now! Whoever said you can’t make a purse out of a sow’s ear certainly didn’t know you! Thank you so much for this experience. I’m sure you and Matt will both enjoy this room. Love to both of you. Wow it is so amazing how this dreary non descript house has become beautiful,stylish and so comfortable. Your vision should teach others to visualize what a house could be and not just walk away from a house that is a deal but not perfect. The room you have done just blow my mind. The beginning was so blah and dull and now they are so stunning. You have such a gift and thank you for sharing it with your readers. 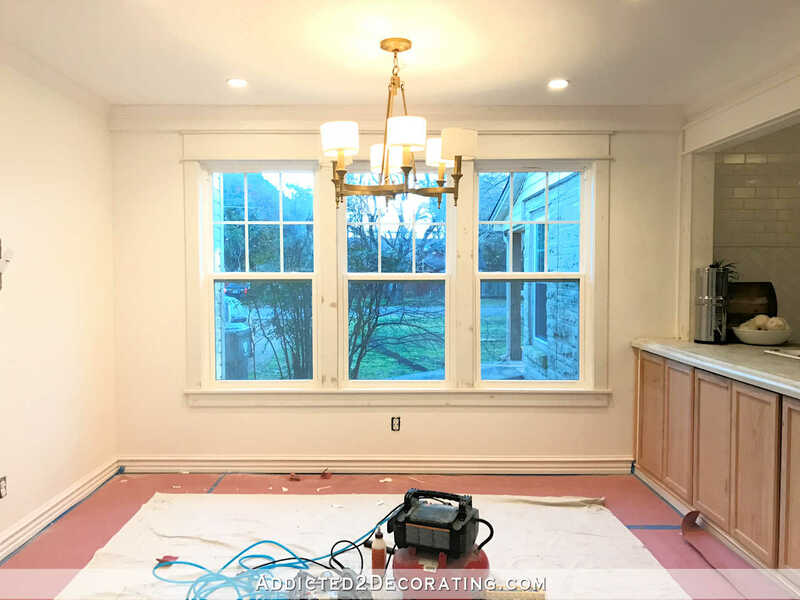 Your talent out shines Fixer Upper because you do everything yourself from construction to hiring contractors for some jobs to decorating and doing that your self. 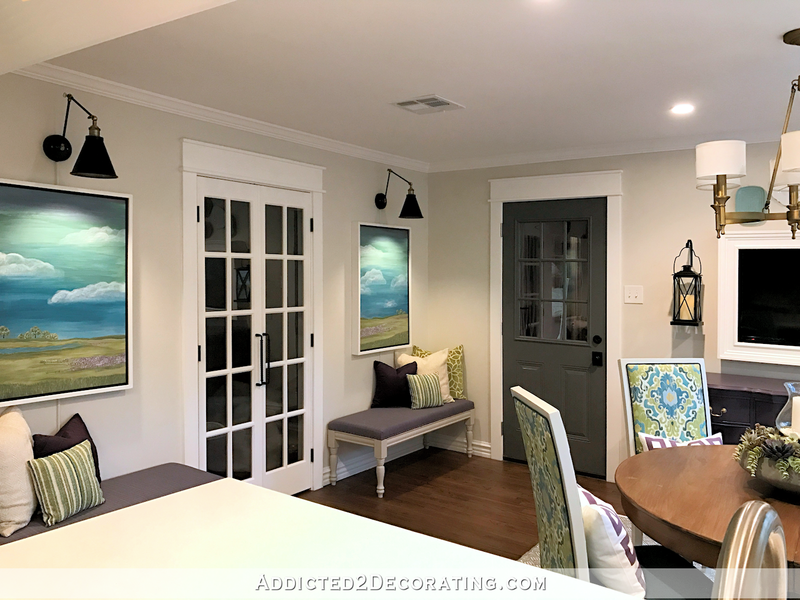 Your use of color combined with your woodworking, sewing, painting, etc, etc skills make this room a true stunner. You are an artist in every sense of the word. Congratulations on the completion of this room and I can’t wait for the next installment. What an amazing transformation! I could never have imagined looking at that original space and envisioning what you would be able to do with it. 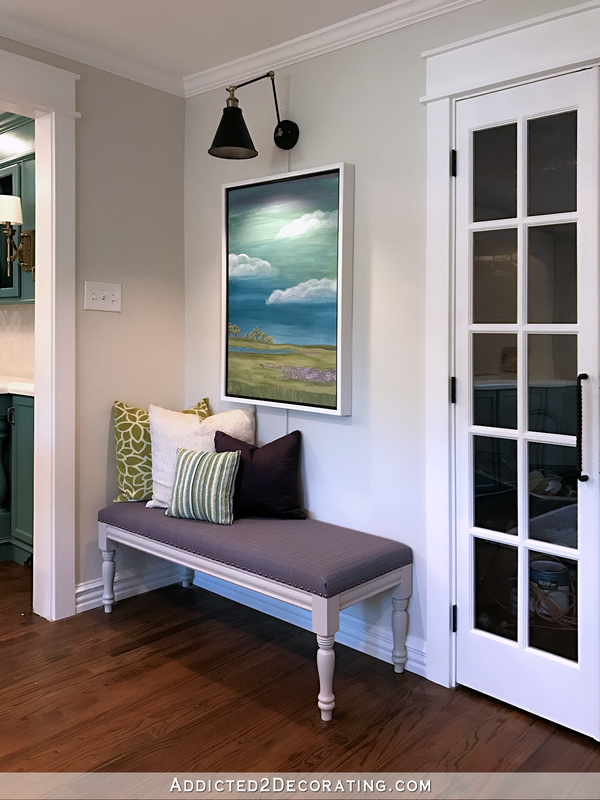 I’m most impressed with how you took what was essentially an afterthought of a space and incorporated it seamlessly into the rest of the house. Who knew you could do what you did with that floor? And it all looks very comfortable, and very you. Well done!!! F ~ A ~N ~ T ~A ~ S ~ T ~ I ~ C…..!!!!!!!!! Magnificent!! You rock and are my renovation hero!! 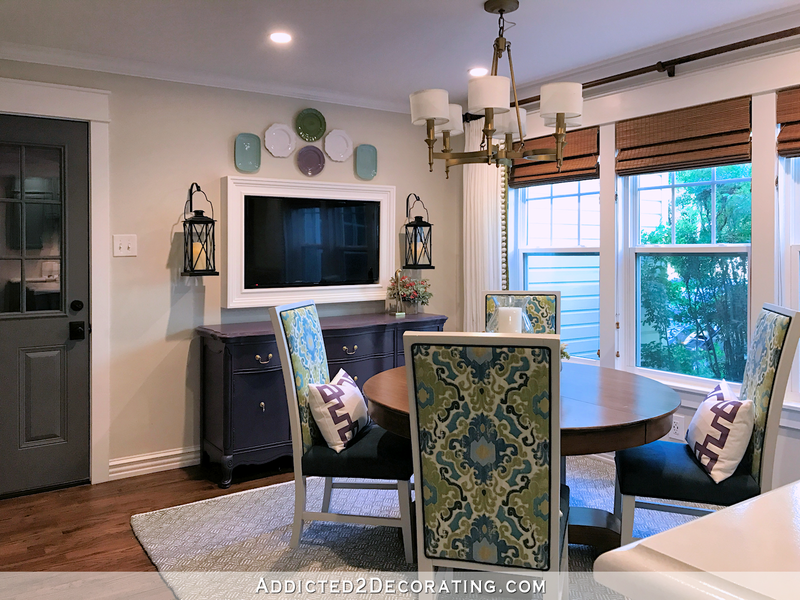 What a gorgeous room Kristi! All the attention to detail and al those wonderful, yummy colors. Love it! Congratulations on a wonderful transformation! I love everything in this room. It’s so funny because when you put the purple buffet in I thought ok, this is where we part ways on what goes in this room but that’s ok because I still enjoy your decorating. Now that it’s all put together I can honestly say I love it all including the purple buffet. Beautiful! I wish I had your vision. You Did It!!! So happy for you to have a room completed with such flair. Enjoy!! A STUNNING transformation!! Absolutely beautiful, and I love your artwork! You ARE an artist! !